A beauty inside and out. Exclusive features for the win! 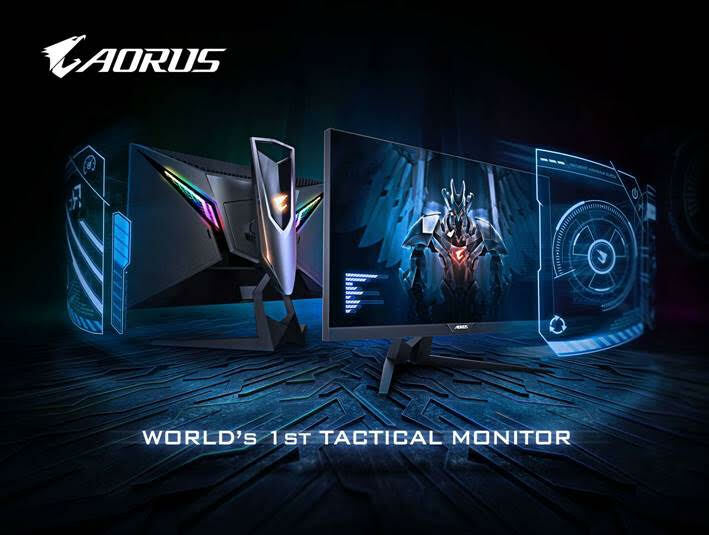 Taipei, Taiwan, January 18th, 2019 –GIGABYTE TECHNOLOGY Co. Ltd, a leading manufacturer of motherboards and graphics cards, has launched the world’s first tactical gaming monitor, AORUS AD27QD, today. Heading into a new market, AORUS is well prepared and confident that the exclusive features on the monitor can give gamers a tactical advantage over their enemies while gaming. AORUS AD27QD is a 27inch flat screen frameless monitor. It uses an IPS panel with QHD (2560×1440, 2K) resolution and a 144Hz refresh rate in 1ms (MPRT) response time. Not only is the view angle up to 178 degrees, it also meets 95% DCI-P3 standards along with 10bits color, so the monitor can provide users astonishingly beautiful pictures. On top of that, the monitor has passed VESA certified DisplayHDR 400 standards which gives users spectacular display quality; With AMD Radeon FreeSync​™ technology, the monitor can provide the most fluent gaming experience to let you enjoy your gaming without picture stripping. The key idea of our outer design is to replicate the dive of a falcon when it is pursuing its prey. When you look at the back of the product, you can see a falcon diving downwards with the glowing eyes of the falcon on the side of the stand and its wings flapping along with the LEDs flashing on the back of the panel. In order to achieve this, we used digital RGB LEDs instead of traditional LEDs. We care not only about the appearance of our product as ergonomic design is also important to us so we added in several ergonomic features carefully without affecting the design theme. We designed a handle on the top of the stand so that users can easily move their monitor around without any trouble. We also considered that cable management is important to our users, so we designed a rubber cable tie just below the ports and reserved a hole at the bottom of our stand to let the cables go through nicely. There are lots of exclusive features on this new monitor and they are all delicately designed to meet the gamers’ needs giving them a tactical advantage in game. Features such as Black Equalizer, Aim Stabilizer, GameAssist, hardware information Dashboard, OSD Sidekick, and the most unique feature of all, the Active Noise Cancelling function,are all designed to let gamers gain more control of the game and their PC system. Black Equalizer：Brightens up the dark parts in the picture for better visibility in dark areas. Aim Stabilizer：This feature will help you reduce the blurriness of the recoil effect while you are shooting in an FPS game. It can also help you trace moving enemies much easier. GameAssist：This is a kit of OSD functions that helps you in game. It includes a customizable crosshair, a counter, a timer, and multi-screen alignment lines. AORUS Dashboard：We can display hardware information directly on screen, such as mouse DPI and GPU/CPU information. OSD Sidekick：You can now control the monitor through this software and control your OSD with mouse and keyboard. A much easier way to adjust your monitor. Active Noise Cancelling(ANC)：When you plug your mic into the monitor, it can help you cancel the noise around you. The only thing that goes through the mic when you are communicating with your teammate is your voice. By utilizing these features well, gamers can create a huge advantage overtheir enemies, making this monitor not just a monitor but tactical equipment; tactical equipment that can help gamers control the tempo of the game better. The AORUS AD27QD monitor uses a joystick to control its OSD, making controlling the OSD a lot easier. Besides the joystick, the OSD Sidekick software can be used to adjust your monitor with your mouse. Moreover, you can set hot keys for every special feature we provide to adjust or switch features on the fly while you are gaming. In addition, the features are directly displayed on the monitor through the hardware solution so you won’t need to worry that the features will be blocked by the game you are playing. The AORUS AD27QD also provides PIP/PBP display mode, which can let you display 2 screens in one monitor. It will be a lot easier for playing a game and watching the game’s guide on YouTube at the same time. Moreover, you can always switch the audio to the one you desire by a simple click. A great solution for people who don’t have two monitors. The AORUS AD27QD monitor also has anti-blue light and flicker free features. With built in power, gamers will only need to carry a simple power cable with them while transporting the monitor, no more heavy adapters. On top of that, the USB port on the monitor can provide 5V/1.5A quick charge, very convenient for gamers to charge up their smartphones. The stand of the AORUS AD27QD is very flexible as well. It can spin 90 degrees for a vertical screen, rotate 20 degrees sideways and -5 to21 degrees up/down, and its height is adjustable up to 130 cm. The AORUS AD27QD provides 2 HDMIs, 1 DP, and 2 USB 3.0 ports, with an audio jack and a mic jack. Gamers can also update the OSD firmware through the OSD Commander software for the most updated gaming experience. Want to know more about the AORUS AD27QD monitor? Check it out on the AORUS official website! GIGABYTE, a global leading brand in the IT industry, offers a broad product portfolio including Motherboards, Graphics Cards, PC Components, PC Peripherals, Laptops, Desktop PCs, Network Communications, Servers and Mobile Phones. GIGABYTE also demonstrates the pinnacle of its hardware excellence in AORUS, in which it provides a full spectrum of innovative gaming products that deliver the ultimate performance and exemplify PC’s capability of bringing gamers unprecedented delights. Since its founding in 1986, GIGABYTE has taken the lead in the world’s motherboard and graphics card innovations and been internationally recognized by National Quality Award, Taiwan Excellence Award, Asia Info Tech 100, and as a Taiwan Top 20 Global Brand. With the idea to “Upgrade Your Life”, GIGABYTE creates innovative digital solutions that completely satisfy consumer needs and desires. Please visit www.gigabyte.com for more information.